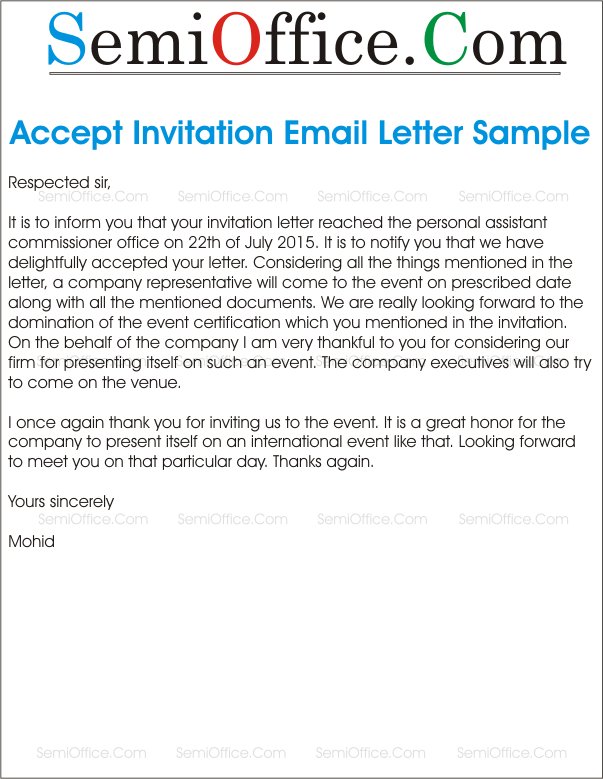 Sample letter to employer in response to job appointment letter to accept the job offer from company, employer, school, college, university or government office etc. This is reference to job offer letter sent by you regarding Interior Design teacher. I humbly thank you for accepting me as your employee as Interior Design teacher. I accept this job with full heart, and assure you that I will never disappoint you and will perform my duty faithfully. I will try my best to follow all rules and regulations. Thanks again for considering my abilities and giving me the opportunity to work with you. With all due respect I would like to inform you that after considering your invitation for the post of Media Manager, I would like to join your Firm. I am glad to know that I have been selected out of many people who applied for this post. It’s my honor to be a part of your team. I would like to know the further details and joining date as well, looking forward for your reply. Thanks. I got your job offering letter and it thrilled me because I wanted to work with this company in the first place that’s why I applied for it. I had several companies in my mind while applying for the job but few were there which actually matched with my style of working and field. I am ready to sign up a contract on the terms you offered me and I am sure you will not be disappointed with my performance and commitment to the job which I have shown you. You have shown enough faith in me by offering me this job and I will show you mine this company. I would love to grow up as the company will progress. I can join the company from the coming Monday as you asked in the letter about this. I don’t know how to thank you but sure my work will. Please accept my gratitude and it would be an honor for me to work with this company. 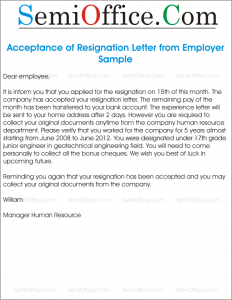 Sample resignation acceptance letter format for companies, banks, schools and organizations. This resign accepting letter issued in response to a resign letter submitted by any employee or staff member of the company, school, social organization etc. Reference is made to your resignation dated 25 Jan in which you have requested that you want to discontinue your service in this department. The reason you have mentioned in your resignation seems of critical nature and keeping that in view your request for resignation is hereby accepted and you are intimated that you may stop attending the office from next Monday please. This letter is to notify that your resignation has been approved. We have received your letter of resignation and after your due verification have also accepted it. 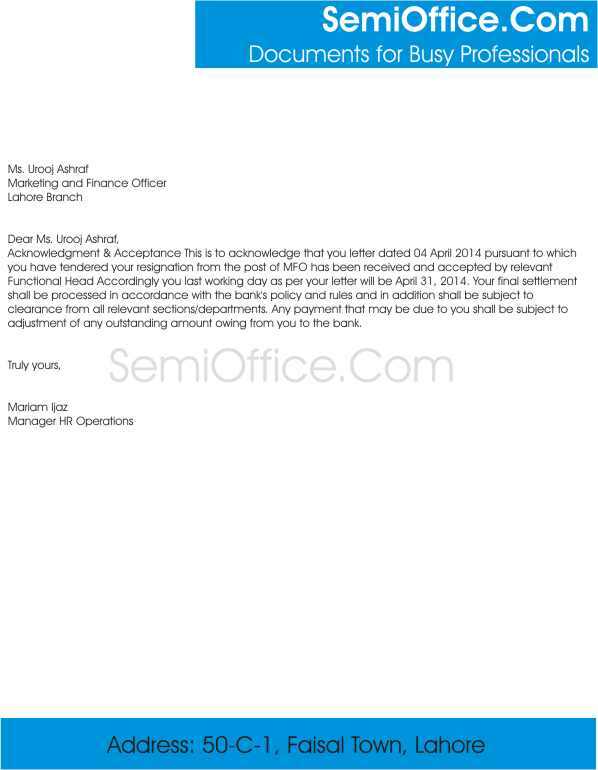 Your salary which was due by the company has been deposited in your account. Further the pension and other funds as you requested have also been deposited in your bank account. We apologize if you have faced any kind of difficulty in your employment duration in our company. Our company would always remain thankful for your contribution in our company. This letter is to inform you that your resignation letter has been approved. You resigned from the job of production manager on 6th may. We had received your resignation and after your confirmation have duly accepted it. All the payments which you had right upon had been credited to your account. We wish you a happy life. This is to acknowledge that you letter dated 04 April 20XX pursuant to which you have tendered your resignation from the post of MFO has been received and accepted by relevant Functional Head. Accordingly your last working day as per your letter will be April 31, 20XX. Your final settlement shall be processed in accordance with the bank’s policy and rules. It is subject to clearance from all relevant sections/departments. Any payment that may be due to you shall be subject to adjustment of any outstanding amount owing from you to the bank. 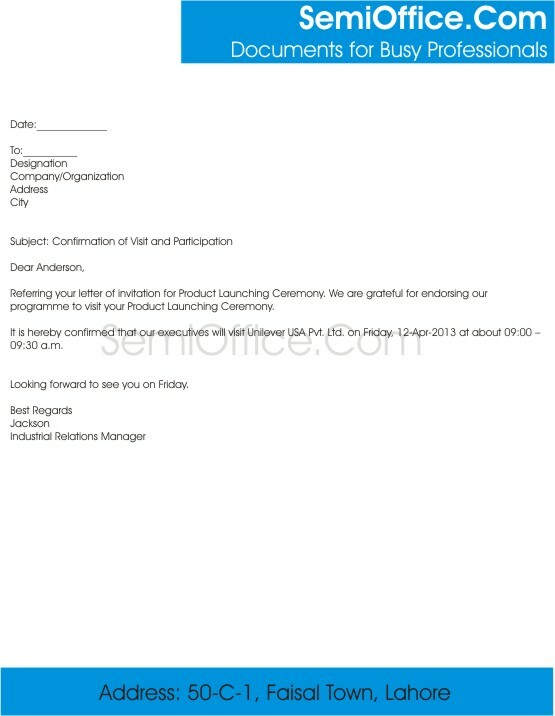 Thank you very much for your email including your resignation from the post of manager marketing. After discussion with the head of concerning department I am confirming the acceptance of your resignation as per terms and conditions agreed at the time of appointment. You can collect an employee clearance form and get it signed from relevant departments. We are grateful for your great services for Semi Office Corp and best wishes for your future. 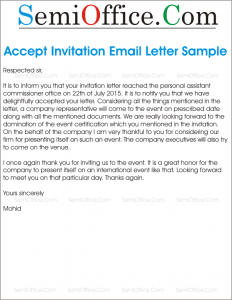 A letter acknowledging the acceptance of the resignation letter from employee of the company. It is to inform you that you applied for the resignation on 15th of this month. The company has accepted your resignation letter. The remaining pay of the month has been transferred to your bank account. The experience letter will be sent to your home address after 2 days. However you are required to collect your original documents anytime from the company human resource department. Please verify that you worked for the company for 5 years almost starting from June 20XX to June 20XX. You were designated under 17th grade junior engineer in Geotechnical Engineering field. You will need to come personally to collect all the bonus cheques. We wish you best of luck in upcoming future. Reminding you again that your resignation has been accepted and you may collect your original documents from the company. It is to inform you that your resignation letter for the post of the assistant manager has been accepted. You are no longer an employee of Rose Petal Group.